Democrat Ned Lamont contributed $8.2 million to his gubernatorial campaign last month, bringing his total investment to $12.1 million since launching his candidacy in January, according to a campaign finance report filed Wednesday night. Lamont wrote personal checks of $3.6 million on Sept. 4 and $4.6 million on Sept. 28, with $2.8 million used to pay for television advertising. 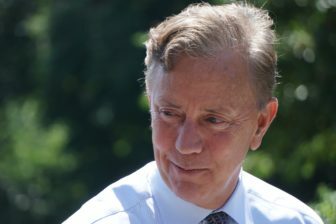 His campaign ended the month with $5.5 million cash on hand, about seven times more than his Republican opponent, Bob Stefanowski. Stefanowski reporting raising $1.5 million in September, but that included $400,000 in loans to his own campaign. A week ago, he announced raising the $1.5 million without mentioning nearly one-third came from him. He now has loaned or contributed $3 million to his campaign and raised another $2 million from others. He had $747,520 in available cash with nearly $150,000 in unpaid bills at the end of the month, leaving him squeezed for cash as his latest television buy ends next week. His campaign is being supplemented by a $3 million advertising campaign funded by the Republican Governors Association. With $620,322 in contributions from others, Lamont now has raised $12.7 million — close to the $12.8 million mark set in 2010 by Republican Tom Foley, who largely self-funded his campaign. The record for self-funded campaigns in Connecticut is held by Linda McMahon, a Republican who spent $50 million in each of her two runs for U.S. Senate in 2010 and 2012. McMahon now holds a cabinet-level post overseeing the Small Business Administration. Lamont contributed $17 million to his U.S. Senate campaign in 2006, when he defeated Sen. Joseph I. Lieberman in the Democratic primary. Lieberman was re-elected that year as a petitioning candidate. Lamont spent another $9 million while losing the Democratic gubernatorial primary to Dannel P. Malloy in 2010. Oz Griebel, a petitioning candidate for governor supported by 11 percent of likely voters in a Quinnipiac University poll Wednesday, reported loaning his campaign another $76,000 in the three-month period ending on Sept. 20. Others gave him $90,000 over the same quarter. He has now has loaned or contributed $158,000 to his campaign and raised another $229,556. Griebel had $38,959 in available cash at the end of September.